Mike Rizzo said he needed a spectacular package to trade Bryce Harper. Did a team offer him a spectacular package? The kid is all grown up at 26 and is a free agent for the first time in his career. When he was 17-years-old, he was drafted in 2010 at #1 overall by the Washington Nationals. For Bryce Harper a.k.a. “Baseball’s Chosen One” , he met those expectations in 2015 when he won the MVP award, but his stardom has not been as dominant since that MVP season. If you think of a baseball contract like a marriage, the end of it sometimes feels like a divorce. It is easier to say goodbye when the relationship is not going well — you know — like when Bryce was batting .209 back in June. Harper finished his season strong offensively, and is now officially a free agent. He is the talk of baseball. The Nationals had a chance to trade Harper before the trade deadline and again when he was claimed by the Dodgers in August, and as we know it did not happen. Nationals’ general manager Mike Rizzo said many times that he would need a spectacular package to trade Harper. One person’s spectacular package is another’s unspectacular package as the beauty is in the eyes of the beholder — but two stories have broken this weekend about packages that Rizzo was supposedly offered. There was no “going away” party for Bryce Harper who may not be going away, but if he does, his last day in a Nationals uniform in Washington, D.C. was cut short by the rain that plagued D.C. all summer. Like the rain dripping down faces, it is very much symbolic of the many tears that anxious Nationals fans have shed when Harper became a free agent. They say it isn’t how you start rather how you finish and Harper finished off his 2018 season strong setting personal records in RBIs at 100+, walks, and games played, and news broke that claimed he was offered a $300 million contract for 10 years that exceeded the $280 million we reported he was offered for 9 years. Expect that the Nationals did not even make their best offer but why help Harper push his numbers higher with the competition. The floor is now set at $300 million. After the trade deadline, Rizzo defended not trading Harper. “It had to be a spectacular set of circumstances for us to move a player of Bryce Harper’s ability level, and we didn’t get any [trade offers] that met those qualifications,” Rizzo said after the trade deadline. On the negative side, Harper’s defense has been second from the bottom of all defenders in advanced metrics of DRS and 5th worst on Fangraphs DEF, and he already has set a career worst mark in strikeouts (169 K) and his batting average was only 6 points above his career low of .243. There are certainly some warts on the prince — but don’t fret, Harper’s agent has enough “Compound W” to make those warts disappear like Harper’s 32.2% chase rate outside the zone in May. In the month of September, Harper showed patience at the plate and only chased 18.5%. 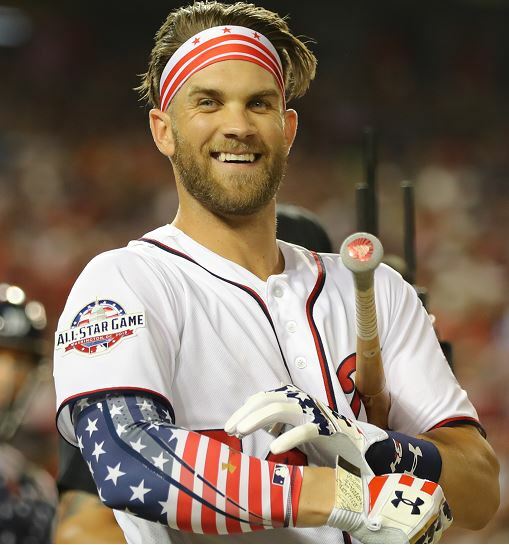 Since the Home Run Derby, Harper has posted a slash line of .300/.434/.538/.972 and that will get him a mega free agent deal from the Nats or someone else. Don’t worry about Harper though, it’s his 3rd best season as ranked by OPS at .889 with a 135 wRC+. His agent, Scott Boras, will make sure “the skies the limit” on his free agent payday, and will do a dog and pony show to steer you away from the negatives and show graphs of Harper’s great second half of the season in an attempt to accentuate the positives and put a spin on the negatives. That skyward limit is set north of Giancarlo Stanton‘s $325 million deal which is a record in baseball. Remember, the Marlins could not find a trading partner who would pick-up the remaining dollars owed on Stanton’s deal as Miami had to send cash to the Yankees to finalize the deal. Oh Harper will get paid, but how much will depend on a myriad of factors in this tax cap era. Most long-term contracts flop at some point, and that love you felt when the contract was signed fades like a masterpiece hanging in a vestibule that is exposed to direct sunlight. Who could forget the once loved Phillies former MVP, Ryan Howard, who was booed often by the home fans when Howard would strikeout with a game on the line. There is an expectations’ quotient in many fanbases that empowers some paying fans to boo at highly compensated players. It’s one thing to boo at players from the road teams, but not at your own players. Even at his worst in D.C., the home fans never booed Harper. For some, marriage is finite, and they always expected Harper would leave after the 2018 season which made it difficult to love him. Some fans moved on back in June when Harper was hovering around “Mendoza” and they bought the Juan Soto jersey. It was easier to move on at that point in time. If you rank Harper along with his teammates, Fangraphs has him as only the 5th most valuable player on his team. Juan Soto who has had nearly 200 fewer plate appearances is ahead of his mentor by 0.2 WAR. “…It’s going to be an exciting future for the Nationals, and we’ll see if I’m in those plans” — Bryce Harper said on the last day of the season. Harper will be in the Nats plans if he wants to be, and that was made clear with that $300 million offer. There’s enough mutual interest that of course the Nationals want him back but at what price? “It’s a complicated negotiation. Suffice it to say, I think Bryce likes it here. We would love to have Bryce. If it’s something that makes sense for both Bryce and for the Nationals, we would love to have Bryce Harper here in the long term.” — Nationals’ General Manager Mike Rizzo said the last week of the season. If Harper wants to break the bank, he might end up in Philadelphia at Citizen’s Bank Ballpark next year because they have to cash to stroke off some big checks. If it is about quality of life, the decision could be to stay in Harper’s home away from home in Washington D.C.
“For me, I’ve just been trying to enjoy my last year in D.C. — if that’s how it’s going to happen. Like I’ve said all along, I love D.C. I love being here. I love being a part of this organization. We’ll see if I’m in those plans or not going forward.” — Bryce Harper said towards the end of the season. There you have it. The future will look bright for the Washington Nationals with or without Bryce Harper. With him, the team has Juan Soto, Victor Robles, and Adam Eaton which is a good problem to have when you have a surplus of star players. Without Harper, the outfield is set with Soto, Robles, and Eaton. If Harper stays, it could shift Soto or Harper to 1st base part-time or another creative move could be made. Bet $100 on Harper to sign with the Nats and you win $700 if he does. In a way, Rizzo bet a ton on Harper by retaining him at the trade deadline and his remaining $7 million salary. If Bryce walks in free agency, the Nationals compensation will be a low pick after the 4th round where you normally don’t find star prospects. Now it seems according to Ken Rosenthal of The Athletic that the Houston Astros offered a large package of prospects that was nixed by the Lerner’s. Sure, ownership thought if they traded Harper he would not want to come back — but loyalties only seemed in hindsight to be with the Nats as Harper got a spectacular offer and did not take it. There will be more revelations about Harper and more sourced comments about Harper like the Dodgers reportedly offered Yasiel Puig for Harper. This is all sourced information with no confirmation from the Nationals which leads to that we do not know the accuracy of any of this so take this information for what it is, and get ready for a whole lot more drama. Will the words of Ron Harper, Bryce’s dad, ring true from what he said back in 2011? Bryce’s blue collar hustle kind of disappeared and you have to wonder if Ron’s desire for Bryce to be a National for life will go the same way. This entry was posted in Harper, Lerners, MikeRizzo. Bookmark the permalink.